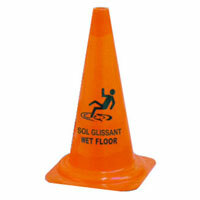 Slips and falls are the second-leading type of accidents, following car crashes, in the United States. 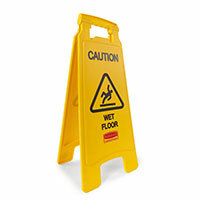 More than 3 million foodservice employees and 1 million customers injure themselves in slips yearly. Of those customers who decided to sue, the average liability award was between $60,000 and $100,0001, a staggering amount for any business to have to pay out. Caution signs are an important piece of equipment for any business to have; they allow you to warn customers and employees of potential danger in the area, protecting them from injury and protecting you from potential lawsuits or worker's compensation claims. OSHA mandates that caution signs must be easy to read from a distance of 5 feet, and the danger should be conveyed in words and/or pictographs. If words are used, the wording should be concise and easy to understand. There are several different types of warning signs available, with your planned usage determining which will work best for you. Below are some of the safety signs you may want to consider for your business. 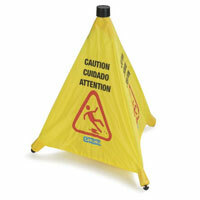 Two-Sided Caution Sign Two-sided caution signs are most often yellow with bold black text and images warning of a nearby wet floor. These are generally printed in English, while some also have the text in Spanish. This sign type is lightweight and folds up easily for storage and transport. Four-Sided Caution Sign As the name suggests, a four-sided caution sign is made similarly to the two-sided models, but with four sides for added stability and to allow you to warn people approaching from all sides. Not all models fold, and those that do won't fold quite as thin as two-sided units. 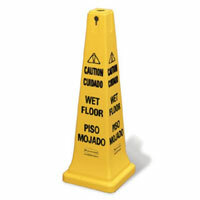 Cone-Style Caution Sign Cone-style safety signs do not fold for storage, but are very stable and less likely to be knocked over. These may have text only or an image may be included, and some models have up to three languages displayed. Some units may include a belt cassette on the top to allow the cone to serve as part of a barricade. Pop-Up Caution Sign Pop-up signs can have two, three, or four sides. 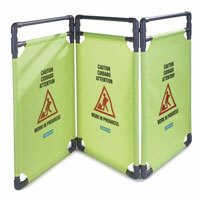 These fold easily and 'pop up' when needed, and are usually made out of durable nylon fabric. These are available in yellow and orange and often have warnings in several languages. Over-the-Spill Pad These are multi-purpose warning signs. 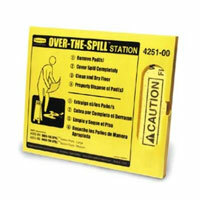 They are made to be placed over the spill, and absorb up to 12 ounces of fluid per pad in addition to warning those in the surrounding area of the potential slip hazard. Safety Barrier Safety barriers are made to not only warn of nearby danger, but also provide a physical barrier to prevent customers and employees from entering the area. These can be a one-piece folding design, like the one pictured, or a combination of cones and chains. Rubbermaid also offers an accordion-style barrier on wheels to provide flexible setup options and easy transportation. Provide anti-slip mats in areas such as dishrooms where water and grease on the floor are common hazards, and ensure adequate drainage is in place. Make sure all indoor areas are well-lit and uncluttered. Ensure that handrails are installed where needed. Parking lots and sidewalks should be well-maintained and properly illuminated at night. Be prepared for inclement weather with salt or sand for sidewalks, and have absorbent entrance mats at each doorway. 1. Slip and Fall Facts. The No Slip Zone. Accessed January 2016. 2. Research to Reality, Vol. 14, No. 1. Liberty Mutual. Accessed January 2016. 3. Factors associated with use of slip-resistant shoes in US limited-service restaurant workers. Injury Prevention. Accessed January 2016.